I’ve been taking a little break from sewing and wanted to pop in and tell you I’m picking up my knitting. It’s nice to snuggle up with my girls on the sofa and knit. Plus, I have an enormous yarn stash to knit through with lots of very luscious and amazing yarns! I did a bit of yarn splurging a few years ago (!) and would really like to get to some of it. 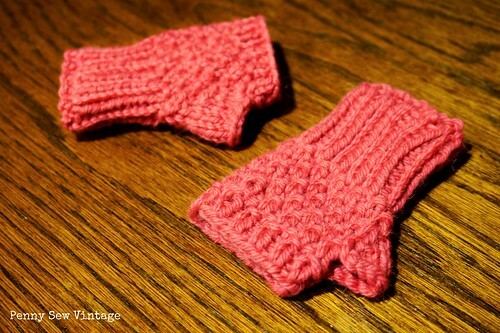 The first project I finished are these super adorable fingerless mittens. I actually began these a couple of years ago for my big girl, but I’m happy to have finished them in time for my little one to wear. Yay to procrastinating and having another girl to make finishing them worth while! 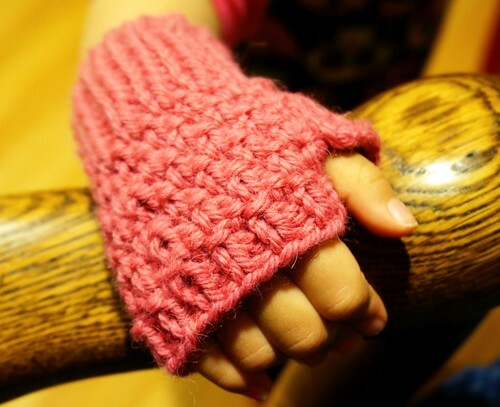 The pattern is the Half-Pint Fingerless Gloves which I found on Ravelry. I used the suggested yarn in pink and size 8 needles. A little closer…it’s a really simple moss stitch with ribbing that keeps them from looking boring, and once you actually knit them, they’re pretty quick. They are so cute when she wears them, and her fingers are free to play. 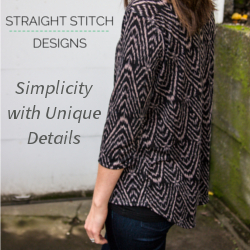 This pattern is also available in more sizes, and it’s FREE! I’m making some as gifts too, so I’ll share how it turns out in the ladies’ size. 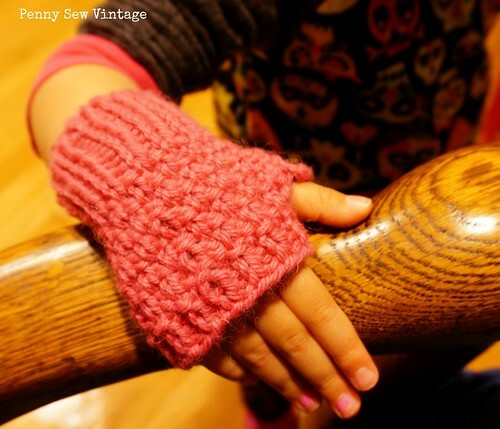 Are any of you knitting for your little ones? Their projects go quickly because they’re so small!